The hate-filled mob currently besieging the Conservative Party conference in Manchester – though only a part of a larger, peaceful protest – may not be representative of the wider British Left. But they are the only ones being noticed by the country, and their chosen man is now Leader of the Opposition. Like it or not, when people think about opposition to the current Conservative government they no longer think of people like Andy Burnham or Chuka Umunna – often glib and superficial, but at least committed to the democratic process, working within the framework of Britain’s institutions and respecting the will of the people. Now, they think of something quite different. Ask someone what opposition to David Cameron’s Conservative government looks like now, and they will more than likely conjure images of the hate filled protesters in Manchester, driven mad by electoral defeat and pathological loathing of the Evil Tories, willing to say anything and do anything to make clear their opposition to a relatively mild-mannered centre-right administration. They will think of young anarchists in hoodies and middle-aged women wearing pig masks in broad daylight. This is not the kinder, gentler politics promised by Jeremy Corbyn. To be fair, it is not all Corbyn’s fault – Labour’s new leader has gone to some pains to discourage violent and abusive behaviour among his followers. But many on the Left do shoulder a great deal of responsibility for what is now happening. Since 2010 and the arrival of a thoroughly moderate centre-right coalition government, the Left have behaved as though the Tories are the barbarians at the gates. Small (and often ineffectual) attempts at fiscal restraint by the Tories have been greeted as though they were a cruel and deliberate attack on the most vulnerable in our society. The definition of “vulnerable” has been deliberately, relentlessly widened to include about half of the population. The NHS has been weaponised, with hysterical warnings that the Conservatives are about to dismantle the entire system (even though this would be political suicide). Moderate and broadly popular reforms to the welfare state have been portrayed as a virtual genocide of the sick and disabled. When they do these things – when senior Labour politicians or pundits sit in town hall meetings and campaign rallies and let this kind of talk go unchallenged – they effectively lend it their tacit support. When Andy Burnham stands and nods along as a Labour supporter accuses Iain Duncan Smith of behaving like a terrorist toward disabled people, he lends the imprimatur of Official Labour to hyperbolic statements of that kind. And when Labour’s new shadow chancellor, John McDonnell, openly speaks about “insurrection” as a legitimate course of action in the event of failure at the ballot box, that kind of fighting talk is presented as acceptable – normal even – by the grassroots. The scenes from Manchester did not emerge from a vacuum. The seeds were planted carelessly but steadily since Labour lost power in 2010, and decided that their best route back was to act as though a supremely non-ideological Conservative-led government was actually some kind of ultra-Thatcherite coup. Any Labour MP, shadow cabinet member, journalist or commentator who nodded along as the rhetoric heated up and the anti-Tory hatred became a festering sore in the body of the political Left is partly responsible. Where will it end? Possibly somewhere very bad. Though the election of Jeremy Corbyn to the Labour leadership was not a bad thing in itself, it has eliminated many of the automatic stabilisers which once would have kept Labour outward-facing and politically viable. Just when the party needs to seriously engage with swing and conservative voters, they are instead turning inwards and becoming introspective. And with Corbyn in charge – even though he repudiates the more egregious cases of left wing violence and intolerance from among his supporters – it is difficult to see how vast swathes of the British Left can be persuaded that the Tories are anything other than downright Evil, given everything that has now been said and written. And when you view your political opponents as not just wrong but actually morally deficient, it becomes all but impossible to engage with them in a way that persuades wavering supporters to jump ship. No Conservative Party activist currently in Manchester – or wavering Tory voter at home – is likely to switch their allegiance back the the Labour Party after having been branded “scum”. Nothing the Labour Party has done over the past five years – not the deficit denial nor the welfare denial nor the immigration denial nor the Ed Stone nor the bacon sandwiches nor the self-affirming walks on Hampstead Heath – has done it more damage than the embrace of the direct action movement. If you call for insurrection, insurrection is what you will get. If you call for law breaking, law breaking is what you will get. And if leaders of the Labour movement continue to summon these furies, and these furies continue to swoop vengefully down, they will damn themselves in the eyes of the voters. On Sunday we saw the true face of the new politics. It was wrapped in a scarf, it had hate in its eyes, and it had the words “Tory scum” on its lips. If this becomes the face of the Labour movement, then the Labour movement is dead. 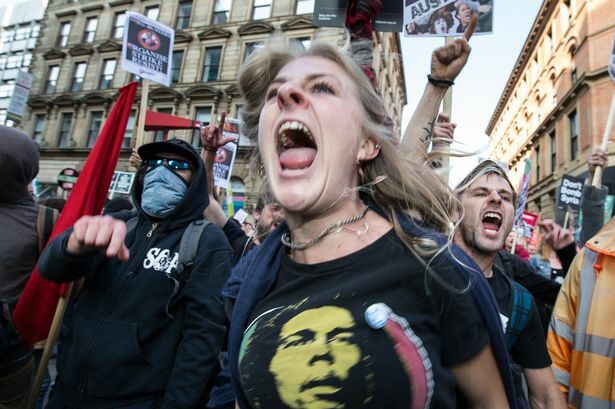 For a group of people who so ostentatiously claim to be progressive, compassionate, enlightened and tolerant, the modern British Left – or at least the only ones capable of attracting media attention at the moment – sure do spend a lot of time indulging in good old-fashioned hatred. Hating the billionaires, the millionaires and the “one percent”. Hating the corporate fat cats. Hating moderate Labour, or the “Red Tories”. Hating people who question the benefits of uncontrolled immigration. Hating people who dare to express a patriotic thought. Hating the Evil Tories. Hating Ukippers. 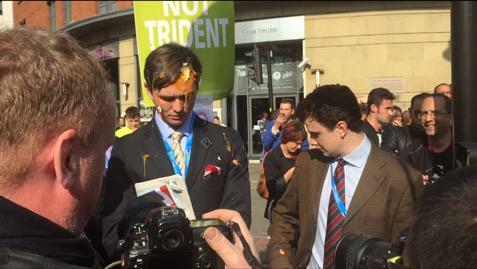 Hating innocent journalists trying to do their job and cover the Conservative party conference. Jeremy Corbyn should not have gone to Manchester to troll the Tories in the middle of their own conference – it merely cements his reputation as a lifelong professional protester rather than a potential future leader. Right now, rather than protesting Jeremy Corbyn and the whole Labour Party leadership should be huddled together, coming up with real tangible policies of their own, or at the very least some honest, fact-based rebuttals of Conservative Party ideas. The longer they delay – with every passing day that the Left allow themselves to be defined by the worst excesses of the Manchester mob – the further away they are dragged from their ultimate goal of regaining power and influence. Moderate and non-violent left-wingers are not directly responsible for the violent behaviour of the ignorant few. Nor are the majority of Jeremy Corbyn’s restless supporters to blame. But many of them are guilty of feeding the anti-Tory fervour which is used to justify the violence and intimidation, and which is currently consuming the Left like an out-of-control wildfire. And until they learn to stop, the Left’s gradual slide into political irrelevance will continue on toward its grim conclusion. Next Article Should Eurosceptics Just “Get A Life” And Learn To Love The EU?